Update, Monday afternoon: Due to weather, Governor Dunleavy was unable to be sworn in in Noorvik today. His plane landed in Kotzebue, where the community put together an impromptu ceremony at the high school. The ceremony went on as planned in Noorvik, with Dunleavy and Lieutenant Governor Kevin Meyer being sworn in virtually in front of the crowd. 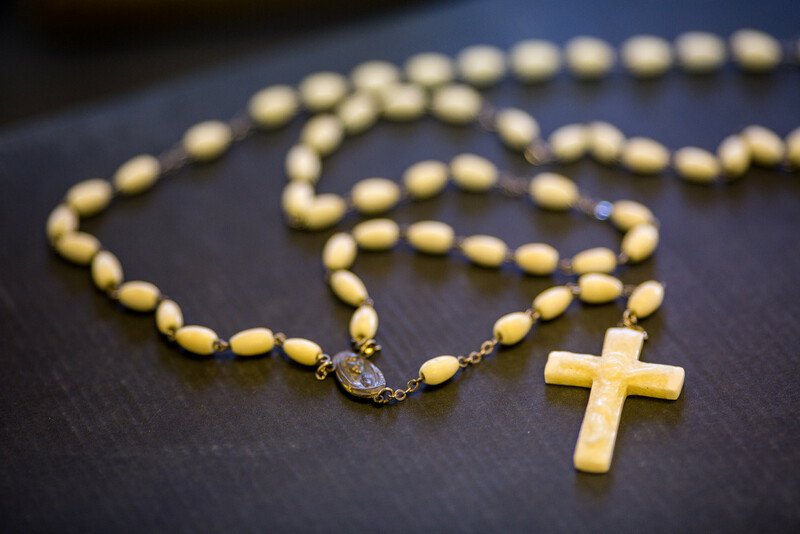 Spirits in the community were still high: while it didn’t go as planned, Noorvik was happy to share the ceremony with their neighbor, Kotzebue. The governor plans to spend time today in Noorvik at the community feast. Mike Dunleavy will be sworn into office today as Alaska’s next governor. 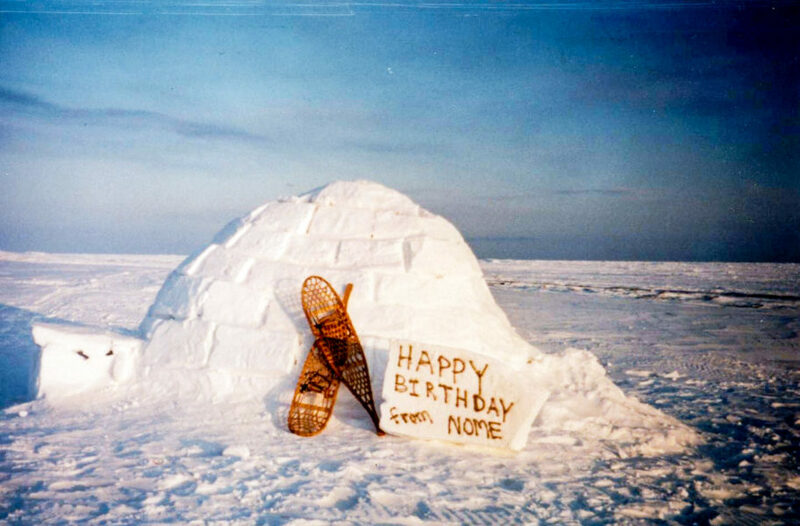 He chose to hold his inauguration in his wife’s hometown, Noorvik. The event is no small deal in the rural community, as its planning includes a community effort, with the help of around 100 volunteers. KNOM’s Katie Kazmierski reports in Noorvik on the energy previewing today’s ceremony. Walking the streets of Noorvik, I hear what I imagine the town typically sounds like on any given winter Sunday morning: snowmachines rounding corners and kids laughing and playing outside. 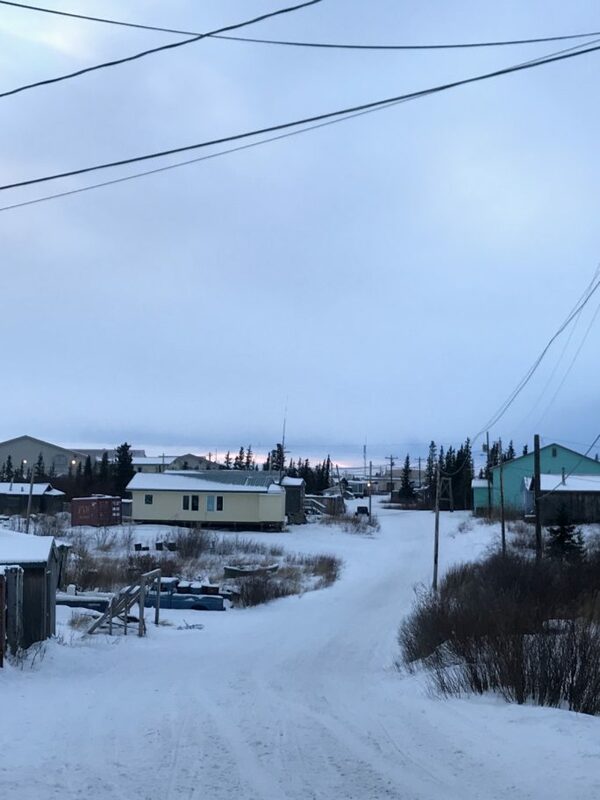 The sun rises in Noorvik, Alaska just before noon on December 2, 2018. Photo: Katie Kazmierski, KNOM. But step inside the Aqqaluk Noorvik School on Sunday afternoon, and the excitement is tangible. Volunteers in the kitchen work busily to prepare 13,000 pounds of food, flown in from Kotzebue, for a giant celebration: an unprecedented one for the 700-person village. Mike Dunleavy is being sworn in as governor this afternoon, and he chose to host his ceremony right here in Noorvik. This makes Dunleavy the first governor to be sworn in above the Arctic Circle. 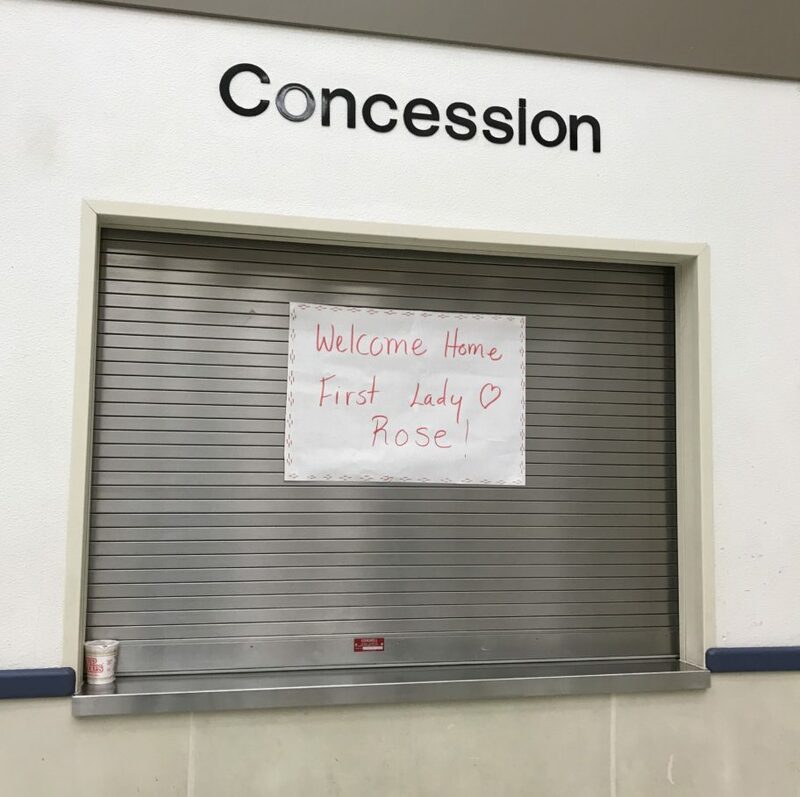 A sign in the Noorvik school cafeteria welcomes Rose Dunleavy, now first lady of Alaska, back to her home village. Rhoda and Molly are two of just under 100 community members volunteering their time and efforts to organize the swearing-in ceremony and celebration. Other volunteers signed up to shuttle reporters and other visitors to and from the airport. Many helped to set up the school gymnasium for the big event, arranging chairs and decorating with flowers. Gia Hanna, the event’s head organizer, pays close attention to detail as she directs the rehearsal of the event Sunday afternoon. She informs those involved in the ceremony that no matter where they’re at in the agenda, the State constitution says that the governor must be sworn in before 12 noon, and so it’s vital that they remain on schedule. 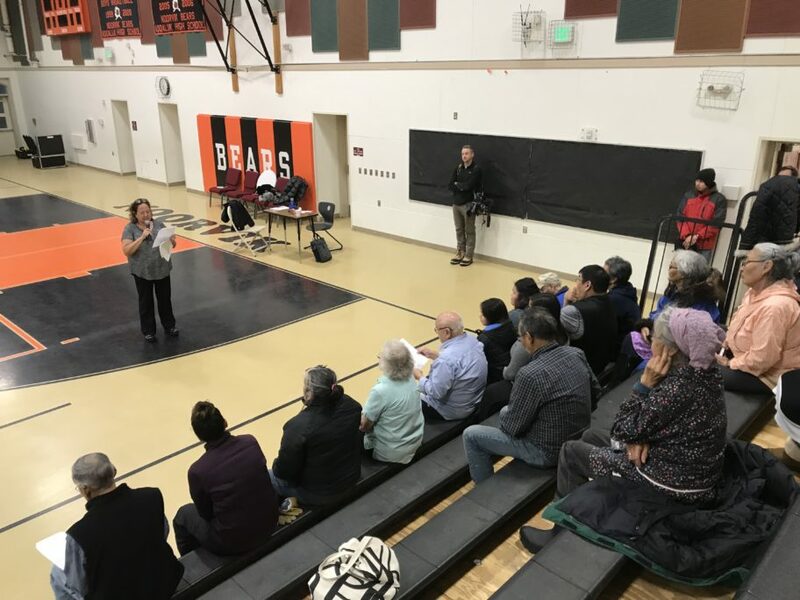 Gia Hanna leads volunteers on December 2nd in rehearsal for the swearing in ceremony of Governor Mike Dunleavy. Photo: Katie Kazmierski, KNOM. Because of space and resources, though, the event is capped at 750 attendees. Community volunteer Sophie Cleveland has been distributing tickets to interested community members. For many, it’s exciting to not only host the inauguration in town, but also to witness firsthand as someone they know closely becomes the state’s governor. Noorvik school principal Faith Jurs shares memories of working with Dunleavy back when he worked in education. Mayor Verne Cleveland echoed how the high-profile event will surely bring attention to the small town. 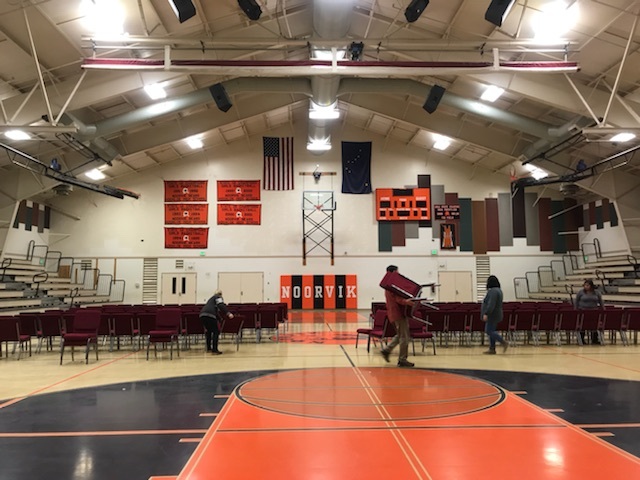 The ceremony in Noorvik is scheduled to start around 10:45 a.m., with Dunleavy and Lieutenant Governor-elect Kevin Meyer being sworn in around noon. Afterwards, the entire town will share in a community celebration feast. Image at top: Prep for Gov. Dunleavy’s inauguration in Noorvik. Photo: Katie Kazmierski, KNOM.